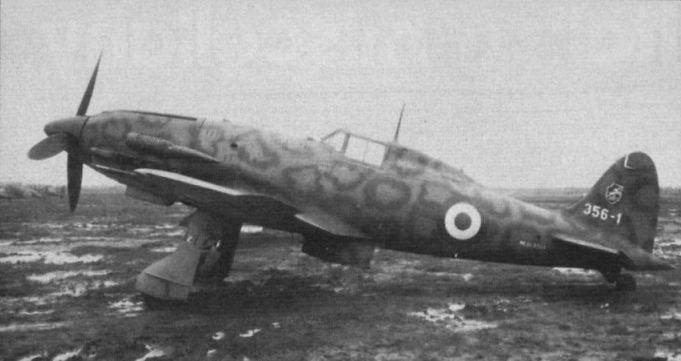 Dispersed on a muddy corner of Lecce airfield on December 29, 1943, was this M.C.202, MM.9101, a Serie VII variant belonging to the 356 Squadriglia, Co-Belligerent Air Force. 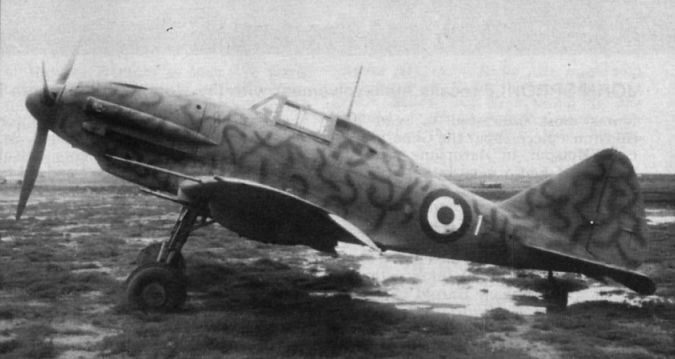 A Macchi M.C.202 in US Army Air Corps markings at Catania, Sicily, on October 5, 1943. On the troubled waters of Brindisi harbour on Christmas Day, 1943, was this Cant Z.506B Airone (Heron) Serie I. It had not yet been repainted in Co-Belligerent markings, and retains the identity of the 186 Stormo Bombardumento Marittimo of the Regia Marina. That Italy was one of the last nations to fully adopt enclosed cockpit canopies is typified by this Macchi M.C.200, serial number MM.4557, photographed at Gerbini on October 1, 1943. A Reggiane Re 2001, Model CN, seen at Lecce on December 24, 1943. This nightfighter was powered by a German Daimler-Benz liquid-cooled engine, and is armed with twin gondola mounted 20mm Mauser cannons to supplement its nose machine guns. A few Co-belligerent aircraft re-adopted the Fascist tail stripes, as seen on this Cant Z.1007bis Alcione (Halcyon) at Lecce on December 24, 1943. 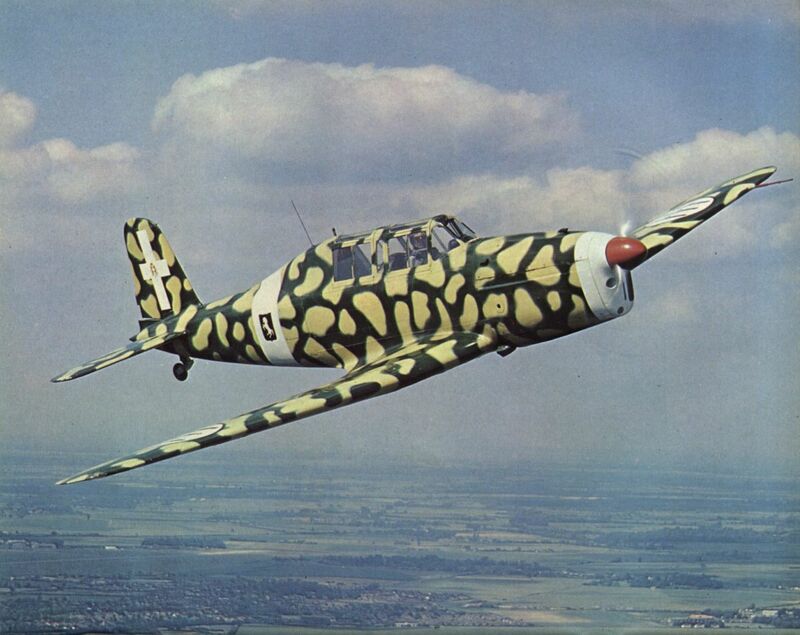 The first Savoia-Marchetti aircraft to feature a retractable undercarriage, the S.M.75 is seen here in its military transport guise. This aircraft was used by Marshal Pietro Badoglio, who became premier when Italy surrendered, and is seen at Guardo, Italy, on February 14. 1944. The Hom Patrick Lindsay's Fiat G.46, G-BBII, up from Duxford on June 20, 1976, with Tony Bianchi in charge. 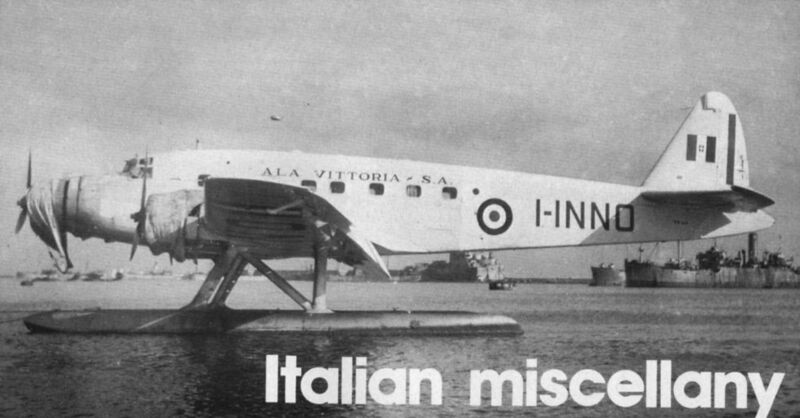 Picture shows the Savoia-Marchetti S.M.87 I-INNO, a seaplane version of the S.M.75. Seen here at Brindisi on Christmas Day, 1943, this is believed to be the sole example to reach the Co-Belligerent forces. 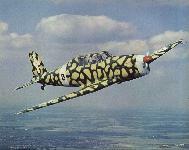 SAIMAN 200 trainers were captured in large numbers and used as "hack” aircraft. This one, sporting the bogus US serial number 51-224, was photographed at Ponte Olivio. Sicily, August 19, 1943. It bears the name "Patches" on the engine cowling.